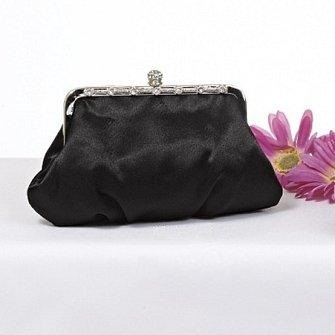 When it comes to your ceremony, the right wedding purse is more than just a beautiful fashion accessory; it's a real lifesaver! Our gorgeous Framed Bridal Handbag is ideal for keeping those last-minute necessities near to hand and for giving you and your bridesmaids the perfect bit of flair before, after, or even during your wedding ceremony! Includes wrist and shoulder strap. Available in Mascara (Jet Black) only. Purse measures 9" long x 5-1/2" tall x 2-1/4" wide. This item has been discontinued by the manufacturer; when the last black purse is sold, this item will be removed from our site. Sorry, no returns on discontinued merchandise. Find additional styles in our full collection of wedding purses!